I met James Newman, the inventor of the megaprocessor. He described the process of designing and building the machine, and stepped us through some clock cycles. 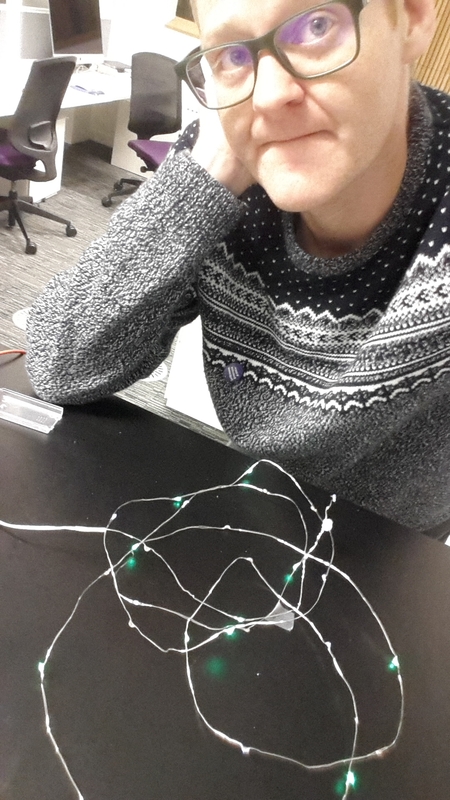 I bought some LED string lights before Christmas and we had them in the office, for some random cheer. The lights were mixed colours, red green and blue. They were powered by two AA batteries, and we left them on continuously for more than a week. After a while I thought some of the lights were broken but later someone else pointed out to me that only one colour remained lit. Only green LEDs for Christmas? With only the green LEDs apparently lit, the voltage measurement on the battery was 1.153 V (1.156 V with no current flowing). A fresh battery capable of lighting all the colours of LED provides a voltage of 1.311 V with the current flowing (1.325 V with no current flowing). LEDS lit R-G-B with full voltage. 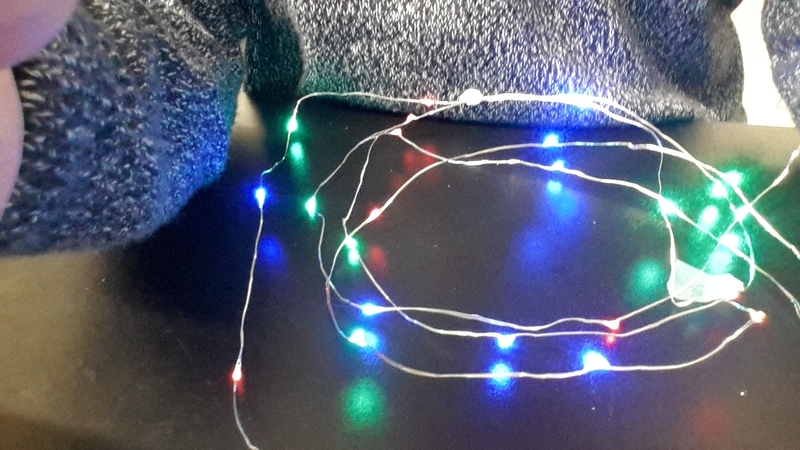 For change in voltage, red LEDs take the least to work, and as the colour moves up the colour spectrum toward blue, the voltage requirement increases (green is between red and blue). So does this mean these LED’s aren’t really naturally green ones, and rely on phosphor filtering? Or some other technology? Is this a problem of perception of brightness of different colours? Digital electronics engineer James Newman, has built a ten meter long, two meter tall processor using transistors. Running at speeds up to 8 kHz the project ran out of control with total spend of forty thousand UK pounds (£40k). Unlike a computer on a chip, the system allows visualisation of the processes and architecture of a modern computer central processing unit (CPU). James is looking to site the computer in a museum or have it tour the UK to educate the public. Currently it’s possible to visit the computer during open days in James’ lounge were the machine was built. A physically large chunk of memory built using LEDs allows visualisation of the data stored, and can be used to play Tetris! More info on the Magaprocessor website: http://www.megaprocessor.com/. Other homebew machines can be seen here: Home Brew Computer Ring. BBC radio Cambridgeshire held a debate with five candidates who have declared they will be standing for the member of parliament for Cambridge. During July 2013 I attended Adventures in Physical Metallurgy of Steels hosted by the Phase Transformations and Complex Properties research group of the Department of Materials Science and Metallurgy. The programme looked like this, videos are appearing on bhadeshia123’s channel on youtube (links). There is also a playlist available. `Cam conservators’ have introduced their final solution to permanently resolve the Mr Asbo problem and removed him to an `undisclosed location’. Lord Sainsbury of Turville has been elected by Alumni (the Senate) of the University of Cambridge. Lord Sainsburys succeeds the Duke of Edinburgh who retired as Chancellor on 30 June 2011. The election was the first election since 1950 and the first to use the single transferable vote system. Lord Sainsburys received 52% of the vote on the first count. I’m not sure how we survived since 30th of June without a Chancellor?